The NOAA National Coastal Data Development Center (NCDDC), a division of the National Ocean Data Center (NODC), and the Northern Gulf Institute established the Ecosystems Data Assembly Center (EDAC) in July 2006. Serving as a developmental data site for NCDDC, the EDAC also directly supports the ecosystem-focused, Gulf of Mexico science mission of the NGI. NCDDC and NGI created the cyber- infrastructure of EDAC to provide access to ecosystem-related observations, data bases and ocean forecast output relevant in and around the Gulf of Mexico and elsewhere. 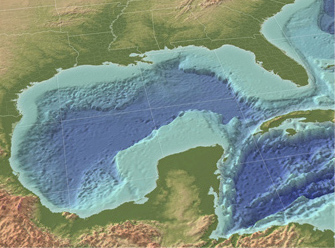 This information (available to scientists, resource managers and the general public via the EDAC) supports research helping to increase the understanding of the unique physical, biological, and chemical characteristics of Gulf of Mexico Regional Ecosystems. See OceanNOMADS for real-time and archived ocean prediction system output. When Deepwater Horizon oil threatened the northern Gulf, this NOAA/Navy/NGI partnership provided high-resolution, real-time and archived Gulf currents that NOAA responders and academic researchers used to track the daily progress of the released oil. Similarly, when the damaged power plants from the Fukushima earthquake and tsunami released radioactive water into the Sea of Japan, this partnership again provided ready access to operational ocean model currents necessary to monitor this threat for both immediate response and later study. The NOAA Operational Model Archive and Distribution System - (NOMADS), provides distributed, web-service access for real-time and retrospective, format-independent climate and weather model data and related datasets. NOAA NCDDC, with partners including National Weather Service National Centers for Environmental Prediction and NGI, has created this NOMADS node for ocean-model access, called OceanNOMADS. NWS provides real-time access while the NCDDC capability provides retrospective access to long time series from mature NCEP and U.S. Navy ocean modeling and prediction systems. Long-term archival of selected model fields is done at NOAA's National Oceanographic Data Center. The developmental version of the OceanNOMADS capability developed under the NGI EDAC project continues to offer analysis-tool development as well as access to emergent real-time as well as retrospective NOAA and Navy ocean prediction information, with primary geographic focus on the Gulf of Mexico.